This is a sample entry from Don DeBartolo’s email newsletter, Trade Spotlight: Futures, published on Tuesday, December 6, 2017. There is a trade opportunity based on a potential breakout in the Lean Hogs futures market. The Stochastic indicator is showing a downturn in Momentum. The Trend Seeker is up with a strong ranking. 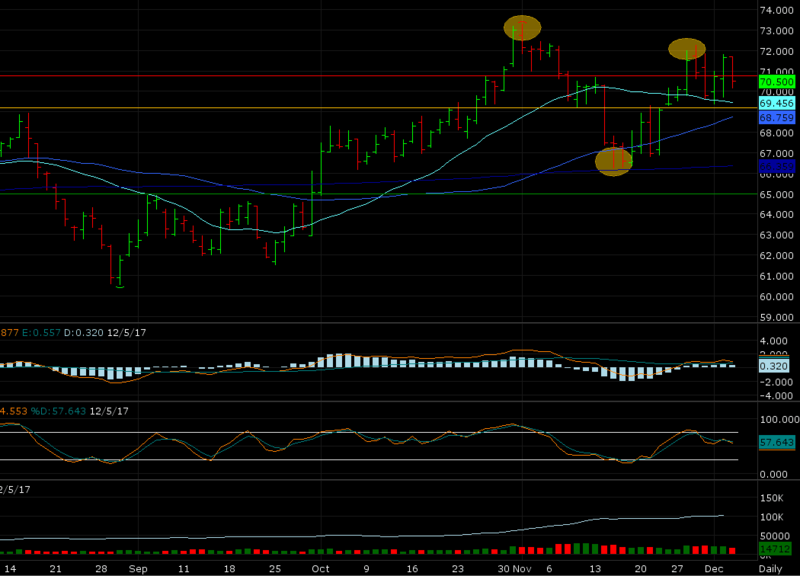 However the MACD indicator, a trend indicator, is set up to hook over bearish. On a break of a lower support level and the 20-day Moving Average (69.456), expecting the Trend Seeker and indicators to shift down swiftly. Let’s have our order working in anticipation. There is a larger 1-2-3 Top Formation in place as well. Also, there is seasonal tendency to be short in the first part of December. Sell the February 2018 Lean Hogs futures contract at 69.175 using a stop order, GTC.